Yancy releases Stars, Guitars and Megaphone Dreams! If you’re like me, you’re always looking for GREAT children’s music to both lead kids in worship as well as play in your environments as families pour in and out. Time and time again, Yancy delivers with great music for those purposes. She’s truly stands out as a leader in this unique genre. So, help Yancy get the word out. Not only do you need to purchase the CD/DVD, but tell everyone you know! Here’s what you need to do. Listen to the album now by clicking here! Get a free download of the song “Make it Loud” by clicking here (I think you need to have twitter, but it would be worth signing up for twitter to get the song). After sending out the tweet, leave a comment below saying you did it. On Friday I’ll pick a winner. 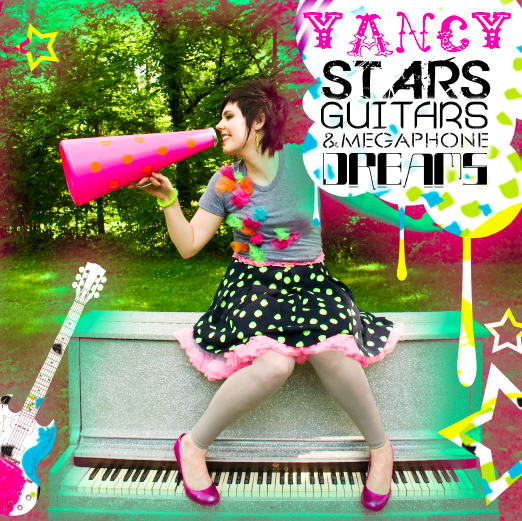 (NASHVILLE, Tennessee) — Combining praise and worship with her unique pop/rock sensibilities, Yancy returns with her latest albumÂ Stars, Guitars and Megaphone Dreams, available everywhere on November 2nd. With a decade under her belt, and countless credits to her name, Yancy has proven herself to be one of Christian musicâ€™s most versatile performers. As a recording artist, Yancy has released radio friendly pop/rock albums, a rocking Christmas collection and multiple projects for kids and young adults, all while sharing the stage with such artists as Mute Math, Newsboys, 4Him and Nichole Nordeman. As a writer, Yancy has teamed up with Third Day’s Mac Powell, wrote Avalonâ€™s #1 hit â€œI Donâ€™t Want To Goâ€ and Jaci Velasquezâ€™s â€œSomething Beautiful,â€ and still found the time to compose two devotional books for worship leaders and musicians and a devotional book for pre-teens. Widely recognized as a top worship leader at numerous conferences and conventions, Yancy also helped launch the nationwide Kings & Princesses events with her dad (and veteran childrenâ€™s pastor) Jim Wideman. These unique events are created for Dad’s and their elementary age daughters, creating a fairy tale night that will strengthen father and daughter relationships. Yancy maintains a full-time tour schedule including conferences and conventions throughout the USA, and this fall, she will return to Christ In Youthâ€™s successful preteen event SuperStart! as the featured artist for the 2010-2011 national tour. The first radio single fromÂ Stars, Guitars and Megaphone Dreams, â€œDonâ€™t Stop,â€ is currently being worked to AC and CHR formats by Jason Miller at Lion Chaser Entertainment. For more information on Yancy or to find out when sheâ€™ll be in a city near you, visit the official website atÂ http://www.yancynotnancy.com. NextLast day to register for Illuminate! I POSTED ON TWITTER! I would love to win!!!!! I tweeted the tweet! Yancy is our FAVORITE!! I tweeter this! Love the newCD would love the combo pack so I could love on a kid with cd I bought! Tweeted to Twitter Nation about Yancy!